We are pleased to offer the following resources, developed by Impact 21 team members, to explain or provide valuable information to professionals in the petroleum/convenience, retailing, refining, and foodservice industries. Please feel free to contact us with any questions or comments. Our Company strives to lead in business best practices, simplified processes and current technologies. Our process brings transformation more quickly to our clients’ businesses. Collaboration and project management solutions as well as Analytics directly impact our clients. 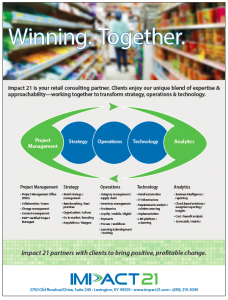 Professional consultants comprise the Impact 21 team. Each person has proven success and expertise in their respective fields. As a solution-neutral company, Impact 21 evaluates each client’s requirements to find the most effective systems and processes and offers customized strategies and services to drive profitability. 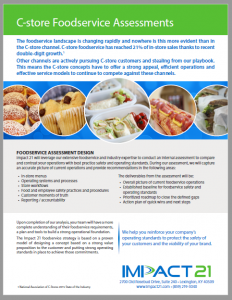 Learn how our foodservice assessments can help you build a strong operational foundation. Impact 21’s cloud-based solution increases inventory visibility, and ultimately profit, by combining data visualization, exception reporting and the critical insights you need. 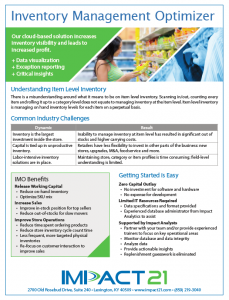 C-Stores, retailers, and foodservice chains are encouraged to download an overview of Impact 21’s 13-Step Merchandise Management Process- Connecting the Dots: Merchandise Management. This complimentary resource helps retailers plan, manage and control products through the retail cycle, from authorization through evaluation for re-stocking.